There’s something extra special about sending a letter with a pretty address stamp! Each and every design is fully customizable and made especially for you. Whether you want something classic and timeless, romantic and whimsical, or contemporary and modern, we’ve got you covered! Fill in the form below to get started! Each stamp includes up to 2 rounds of design revisions, and takes approximately 10 business days to produce after you sign off on your order. Shipping times may vary depending on your location, but will typically take 1-2 weeks with Canada Post. In a rush? Please let us know prior to placing your order. 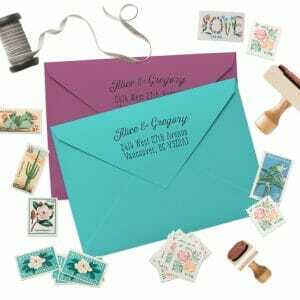 Where your custom stamp needs to go! Tell us exactly what you want, or leave it up to us to design something lovely - every custom order includes up to 2 rounds of revisions, so we'll definitely get it right. + After you place your order, we'll send you the first design within 2 business days. Look it over and let us know what you think. If necessary, we'll send you up to 2 additional rounds of revisions to make your design perfect! + We're happy to work on your stamp until you're fully satisfied - additional rounds of revisions are $15 each. + Please double check your proofs carefully - we want to make sure all the details are correct before you sign-off on your design. + After we get your sign-off, your stamp goes into production. This typically takes about 10 business days. + Hurray, your stamp is ready! We ship with Canada Post; typically it takes 1 week for orders within Canada, and 2-3 for orders to the US. If you need your stamp by a certain date, let us know prior to placing your order, and we'll let you know what expedited shipping options are available.